In February 2003, Los Angeles-based sound artists Ultra-red began a year-long project in the Ballymun area of Dublin, commissioned by Breaking Ground, the Per Cent for Art programme of Ballymun Regeneration Ltd. EntitledThe Debt, their project was a series of collective reflections that brought together residents from the public housing communities of Ballymun and Pico Aliso in East Los Angeles.The purpose of these encounters was to compare experiences of regeneration in social housing. What is the legacy of social housing in Ireland? Set up as a listening room in the Goethe-Institut’s Return Gallery, Archiving The Debt focuses on a specific exchange of experiences, ideas and questions that occurred at a time when large-scale public housing was in under intense discussion in Dublin. Visitors can access recordings made duringThe Debt: resident meetings, conversations with city officials, radio broadcasts, performances and electro acoustic soundscapes of Ballymun. Presented by the Goethe-Institut Irland in collaboration with the National College of Art & Design. Supporting structures made by Andreas Kindler von Knobloch. Situated under Liam Gillick’s Denominator Platform, 2018. ArchivingThe Debt is part of Common Denominator: Art and the Contemporary World at the Goethe-Institut, a two-year programme in the Return Gallery. Through exhibitions, seminars, discussions and more, it interrogates what it means now to speak of political solidarity, civic standards or even aesthetic values. Art in the Contemporary World is a taught Masters programme at the National College of Art & Design in Dublin, focusing on contemporary practices and their cultural, political, social and historical contexts. ACW is led by Francis Halsall, Declan Long and Sarah Pierce. Exhibition runs from 7 February through 15 April 2019. On the occasion of Liam Gillick’s exhibition A Depicted Horse is not a Critique of a Horse at the Kerlin Gallery (23rd November – 19th January) and his Denominator Platform 2018, specially commissioned for the Return Gallery at 37 Merrion Square in connection with Common Denominator: Art in the Contemporary World at the Goethe-Institut, a two-year programme that takes as its starting point Walter Gropius’s term, from which collective knowledges progress. Through exhibitions, events, seminars and more we will interrogate and inhabit what it means in our time to speak of political solidarity, civic standards, or even aesthetic values, and to consider the relation between common commitments and necessary possibilities of individual belief, expression and action. All welcome. Please note space is limited. Arrive early to avoid disappointment. Supported by the Goethe-Institut Irland, in collaboration with the National College of Art & Design. Courtesy the Kerlin Gallery. Kate Friedeberg, Valerie Joyce, Seánan Kerr, Heidee Martin, Grainne Murphy, Orlaith Phelan, Natalie Pullen, Éimear Regan, and Laura Skublics. Rawi, Jane’s Bees, Jasmin Marker, Repeater Collective, Noel Sheridan, John Smith, and David and Sally Shaw-Smith. Presented in the context of Liam Gillick’s Denominator Platform 2018, specially commissioned by Art in the Contemporary World for the Return Gallery. the relation between common commitments and necessary possibilities of individual belief, expression and action. 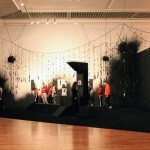 Art in the Contemporary World is Ireland’s leading taught MA at the National College of Art & Design in Dublin. and expanding the role of contemporary practices and their contexts. ACW is led by Francis Halsall, Declan Long and Sarah Pierce. Supported by the Goethe-Institut Irland in collaboration with the National College of Art & Design. Special thanks to the Kerlin Gallery and IMMA | Irish Museum of Modern Art. Exhibition runs through 12th January 2019. Rodin's The Age of Bronze AKA The Awakening Man AKA The Vanquished One (masked) - Box Steel Frame, Walnut Burl Veneer Panel, Painted Panel, nuts and bolts, The Age of Bronze by Auguste Rodin from Dublin City Gallery The Hugh Lane’s collection - 2018.Photo Credit: Ruarí Conaty. Occultation; n. (Astronomy); The passage of a celestial object across the line of sight between an observer and another celestial object; as when the moon moves between the Earth and the sun in a solar eclipse. an opulent fusion of Richard Strauss’s Salomé and Donizetti’s Una Furtiva Lagrima from here the hybridism of language and landscape becomes only more strange. An imposing screen seduces us. Boris, a suited man, appears to await our arrival and scales the grandiose marble staircase of Belfast City Hall in a pair of red high heels. In a duo of impassioned tableau vivant’s he mimics the stance of Sir Edward Carson’s statue, situated at Stormont Castle, Belfast, followed by the Jim Larkin monument on O’Connell Street, just meters away. Both prominent twentieth century political figures immortalised in a state of dramatic public address. Outside the gallery they tower over contemporary cities fraught with new political uncertainties, their power redundant, their bodies now relics cast in silence. McCann breathes a last breath into their predominance and within it gives us space to reassess our own position in relation to both historic and contemporary power structures. In the following scene we follow Boris’s continued ascension as he scales the Ridge View of Black Mountain leaving Belfast city behind having swapped his suit for a panda costume. Still wearing his red shoes, we witness him meandering through dewy grass, climbing fences and encountering mildly inconvenienced cows. He again mimics these political ghosts but this time the man is hidden, masked, he has become a cartoon. The dramatic inhabitance of these two iconic statues becomes a pathetic historical indistinct echo falling on deaf ears. We see his physical intentions without the details of expression, he is present but not apparent, something has passed between us and him obscuring our perspective, our reality. This notion of occultation is pushed further in the adjoining gallery as we encounter our third immortalised male figure in a work wryly entitled The Age of Bronze AKA The Awakening Man AKA The Vanquished One (masked) pertaining to Rodin’s multi named bronze cast male figure (1876-77), a piece from the Hugh Lane Collection. 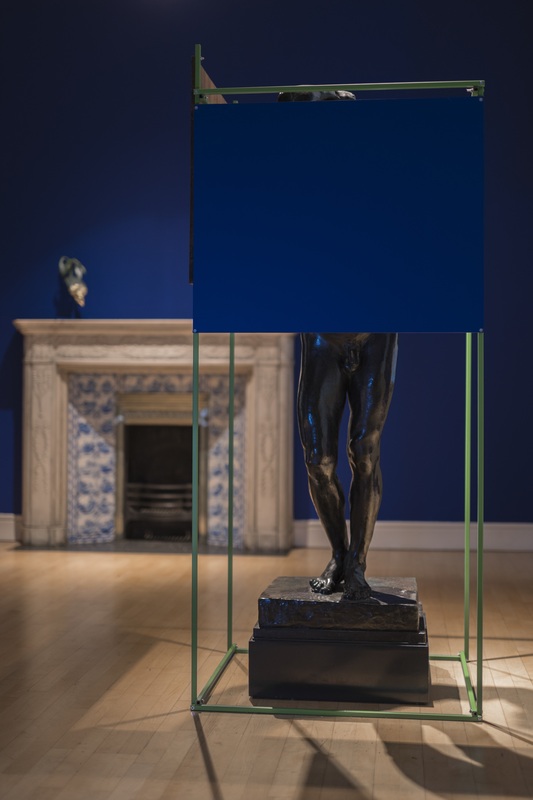 McCann encases the gallery’s own Age of Bronze in a sharp green box frame, his head and upper body obscured with two panels, one blue the other a walnut burl veneer. This is a mongrel of the opposing sides of modernism but beyond its formal and art historical loft dwells a new space for interpretation. Through McCann’s geometric addition the figure of the naked bronze solider appears vulnerable, even caged. As the linear mechanism contrasts with the details and curvatures of his lower anatomy a palpable intimacy develops, yet he cannot “see” us, he is a pawn in a statement, to be looked at but not fully engaged with. These historic male statues and monuments bare a contemporary vulnerability. McCann is redistributing notions of power and how we perceive it. She confidently harnesses these icons like a child might put batteries in an old toy and asks us to look again. Paradoxically there is a sense of the prophetic here, these historic regurgitations feel immediate and succeed through McCann’s ubiquitous intentions, her place amid the current socio-political zeitgeist and our own conception of the dawning of a new order. Art critic Rosalind Krauss writes of the logic of sculpture as being inseparable from the logic of the monument, “It sits in a particular place and speaks in a symbolical tongue about the meaning or use of that place”. McCann’s landscape of artefacts is profoundly routed in the space it inhabits; it is of the institution and rebels tangibly and intellectually within that frame. It is quite literally a Trojan horse, it is a series interventional contraptions concealing rebels and soldiers. Here Salomé no longer dances alone under the gaze of men McCann’s ideas head bang alongside her, amid the Hugh Lane collection, like their parents have gone out of town. Furtive Tears is a spiky romantic affair it confronts us with fact and fiction, real and faux. Like Parrhasius’s curtain the perceived occultation is the work. As McCann’s objects pass between us and the past they momentarily eclipse history and in that darkness dwells a new constellation offering us portals into the alternative, interrogating socio-political shifts and arguing the legitimacy of the relics of politics and art, placing us at the centre of our own truths and preconceived ideas of our idiosyncratic place in story that is history. The Art in the Contemporary World MA/ MFA programme at NCAD and Paper Visual Art are hosting an evening of readings at which artists and critics will read their own words, or those of other artists. Speakers include Sue Rainsford, Suzanne Walsh, Fiona Gannon, Jessica Foley, Lily Cahill and others. 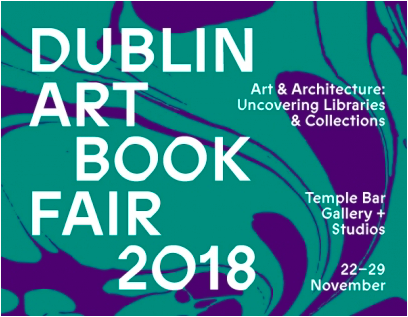 It will take place on Tuesday 27th November at 6pm in Temple Bar Gallery + Studios, Dublin, as part of the Dublin Art Book Fair 2018. Free. Open too all. Refreshments served. Please book a place via eventbrite here. 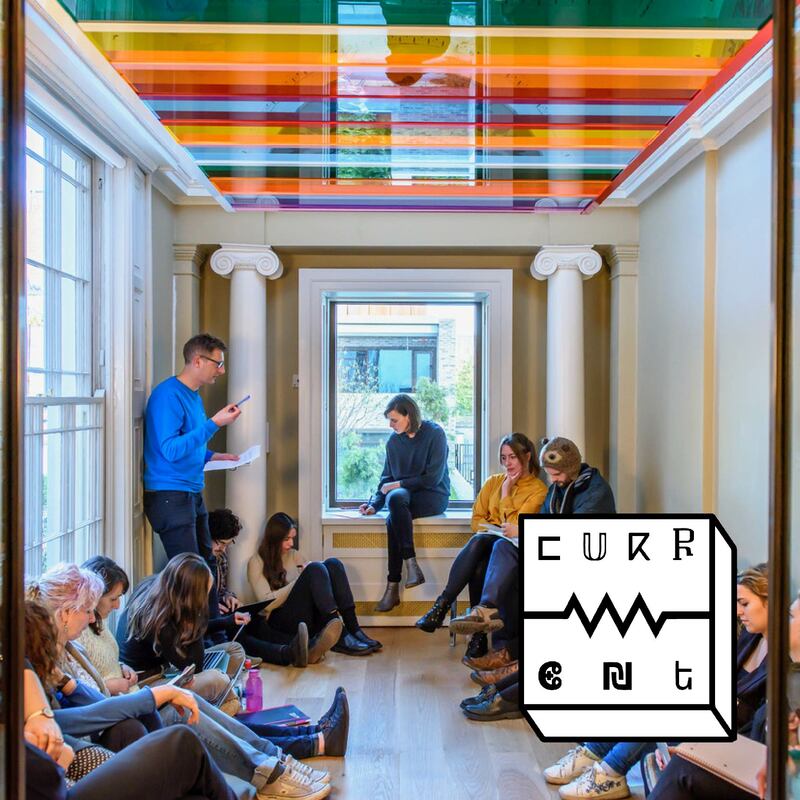 This will be the first of a series of events putting the spotlight on new forms of writing and publishing practices in contemporary art planned for 2018-19. 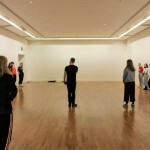 Working closely with the RHA, Katy Fitzpatrick and Róisín Bohan for the Public Engagement and Learning program for the current Futures exhibition, ACW students, Brendan Fox, Natalie Pullen and Éimear Regan developed You, Me and Everything In Between. 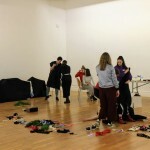 A theatrical workshop loosely based around Augusto Boal’s Theatre of the Oppressed, where participants were encouraged to manifest a performative narrative connecting the exhibition content. The artists featuring in Futures Series 3, Episode 2 exhibition are Bassam Al-Sabah, Cecilia Danell, Laura Fitzgerald, Jennifer Mehigan, Joanne Reid and Marcel Vidal. The work on display by each artist in Futures is unconnected and seemingly disparate as the exhibition is a display of their own personal practice rather than a group show that relates to a specific theme or greater narrative. The challenge set forth in the workshop was to develop a constellation between the artists’ work on display, with an outcome of producing and creating a wholly separate piece of performance art. The artists in the Futures exhibition also contributed to the workshop by donating personal objects for a further insight into their world. Among the objects donated were a paint pot cast from layers upon layers of paint, a silver mask and a metal rod. 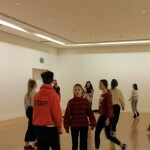 Members of the Dublin Youth Dance Company directed by Mariam Ribon, were invited to participate in the 3-hour-long workshop which took place on Saturday 15 December. The first half of the workshop began with the 11 participants viewing and taking in the work, followed by a meditation and then contained a series of exercises influenced by Boal’s practice where there was a discussion and consequently where the generation of ideas for a narrative emerged. During the second half of the workshop the DYDC participants were divided into three groups and were instructed to develop their narrative of the exhibition through three “moments” that established a final performance. Materials were provided by the facilitators Fox, Pullen and Regan to aid the development and theatricality of the narrative, encouraging the participants to engage in producing a fully embodied piece of art. The dancers infused themselves into the workshop and the outcome was outstanding. 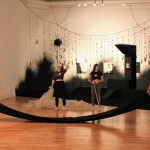 Each group performed their finished piece within the space with the artworks as a backdrop. The dancers’ commitment to the workshop was phenomenal and the creative energy generated in the space was quite special. 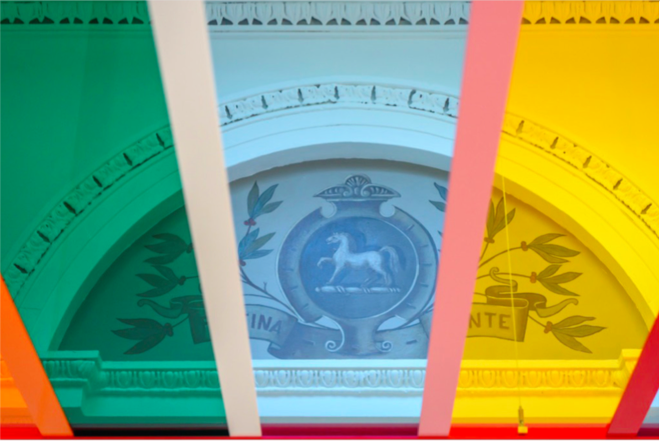 NCAD is looking to appoint a researcher on a 60 day contract from February to September 2019 to conduct research to support L’Internationale’s current programme by the European museum confederation. L’Internationale is a confederation of seven major European modern and contemporary art institutions and partners, including NCAD, that proposes a space for art within a non-hierarchical and decentralised internationalism, based on the values of difference and horizontal exchange among a constellation of cultural agents, locally rooted and globally connected. ‘Our Many Europes’ is the current programme by the European museum confederation “L’Internationale ” The members of L’Internationale, and its partners National College of Art and Design (NCAD), are presenting more than 40 public activities (conferences, exhibitions,workshops) from now and until May 2022. In the first instance, NCAD’s contribution to the network will be to conduct research into performance art as a site of activism on the island of Ireland in the 1990s and to host a major international conference on performance art in the 1990s at NCAD in late 2019. Close partners in this project will be the Project Art Centre in Dublin and the Museum of Modern Art in Warsaw. i. Establish the range and extent of archival material relating to performance practices in Ireland (primarily art but other related fields) in the 1990s. This will include material in public collections (like NIVAL) and private collections. ii. Conduct interviews with performance artists and others supporting this field of practice in Ireland in the period. This material will need to be prepared for online publication (recordings or transcripts). iii. Prepare material relating to the project for a dedicated website containing primary documents. iv. Play an active role in planning and hosting a number of small scale public events such as roundtable discussions in the run-up to the major conference, as well as in the conference itself. v. Present the findings of the research in public settings such as conferences. We seek to make an appointment of someone who has a long term interest in research. The person appointed will have a demonstrable interest in the field and hold a postgraduate qualification. Prior experience of archival research and/or oral history, as well as good writing skills are required. He/she will be based in the School of Visual Culture at NCAD and be supported by the Art in the Contemporary World team. Teaching opportunities may be available for a suitably qualified person. The appointee would also have close working relationships and support from NIVAL at NCAD. Salary – 21.94 per hour (Researcher Level 2) – payable monthly. Maximum no of hours over the 60 days will be 267. Feargal Ward and Adrian Duncan’s film Floating Structures follows a researcher travelling across Europe, exploring an array of buildings and structures that seem other-worldly. Drawing on the ideas and visions of the great Irish engineer Peter Rice, they explore the hinterlands that gave rise to these structures. Wandering from a quiet Bavarian town, to the streets of Paris, to the city of Seville, our past is sifted through and interlinked with precision and wonder. Conical Intersect, 1975, Gordon Matta-Clark, image courtesy of the estate of Gordon Matta-Clark. as Paul’s daily experiences fragment, collapse and are formed anew. Duncan recently premiered his documentary on the work of structural engineer, Peter Rice, ‘Floating Structures’ at the Dublin International Film Festival. His process of making and the aesthetic of his works derives from an interest in language, and the processes of construction, both amateur and professional, he has carried this through beautifully to his writing. The launch will be held at the Goethe Institut on Tuesday 16 April at 6pm. NCAD ACW masters students are currently developing a publication containing a 16 part dossier under the theme of Co-Habitation and will spend 24 hours co-habitating, experimenting, workshopping, writing about, and mapping co-existence. 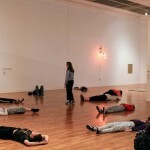 Over the last 7 months, the ACW students involved have studied, written about and discussed philosophy, theory, and surrounding literature concerning contemporary art and writing. The 16 students taking part in this experiment come from a broad spectrum of disciplines and are concerned with the following questions. 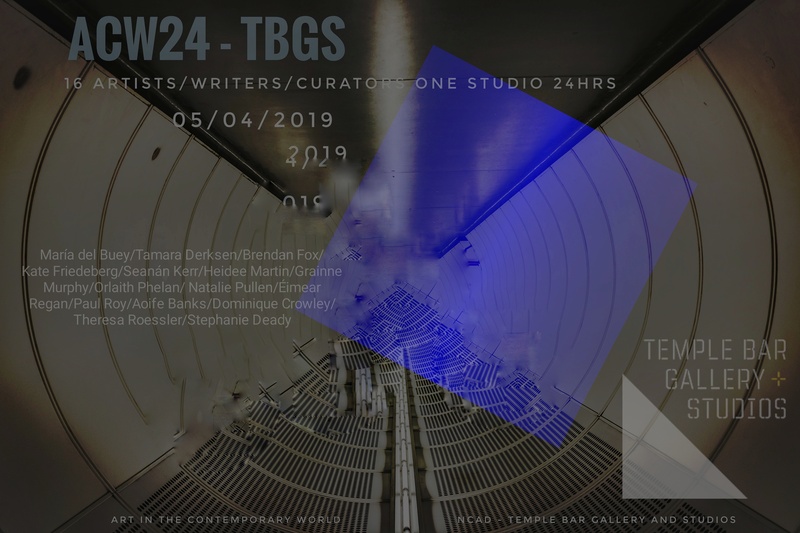 What does it mean for a group of visual artists, journalists, curators, historians, and writers to workshop, debate, critique, perform, write, eat and sleep in a single studio space over a 24 hour period? How will this experience of co-habitation manifest through the process of collective writing? What are the broader socio-political repercussions of co-habitation and how do these issues affect our considerations of this process? Where does contemporary art and writing situate itself in relation to this theme? What does it mean to inhabit a space in these terms? What individual and collective concerns will arise during this experiment? And how will this experiment direct the final publication? During his time in Dublin Dan will lead a seminar on the Assemblage and what it means for thinking about both making and writing about art. 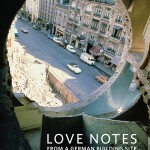 In the book, Paul, a young Irish engineer, follows Evelyn to Berlin and begins work on the renovation of a commercial building in Alexanderplatz. Wrestling with a new language, on a site running behind schedule, and with a relationship in flux, he becomes increasingly untethered. Set against the structural evolution of a sprawling city, this meditation on language, memory and yearning is underpinned by the site’s physical reality. 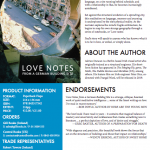 As the narrator explores the mind’s fragile architecture, he begins to map his own strange geography through a series of notebooks, or ‘Love Notes’. Paul’s story will speak to anyone who has known what it is to be in love, or exiled, or simply alone. 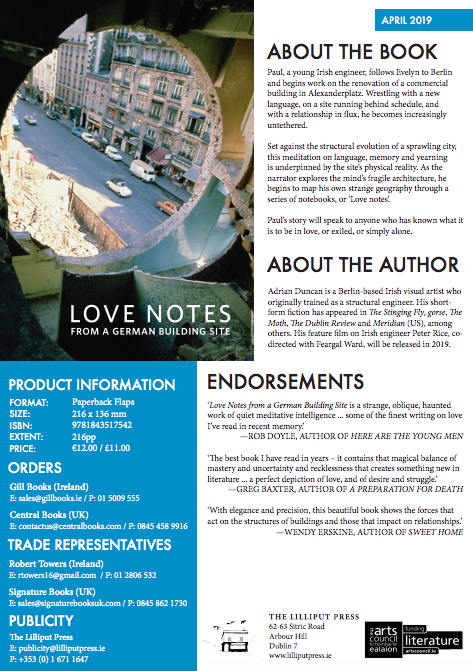 Both of these events are part of “Common Denominator: Art in the Contemporary World” at the Goethe-Institut Irland, a two-year programme of exhibitions, events, seminars and workshops in collaboration with Masters Program, Art in the Contemporary World at the National College of Art & Design, Dublin. Every year ACW offers 1 MA scholarship to incoming students worth full tuition fees. It is are awarded on academic merit and all applicants are eligible, including EU and non EU students. To be eligible for consideration for one of the Scholarship awards applicants should apply for admission to the programme in the normal way. Please refer to Postgraduate Admissions for application procedures. 4) Dublin Digital Radio, Podcast – new episodes coming soon. A show about art ideas and some other stuff too. In Episode one, we discuss artist Liam Gillick, the satisfaction of aesthetic disappointment, modesty in the age of capitalism and spectacle, and much more. Visual Culture is concerned with the spectrum of human creativity: art, design, architecture, advertising, film, media and aesthetics. We interrogate social theories and practices of visual culture and seek meaningful connections between history, theory and practice. The MA / MFA Art in the Contemporary World is a taught programme that examines contemporary art practices and their critical, theoretical, historical and social contexts. 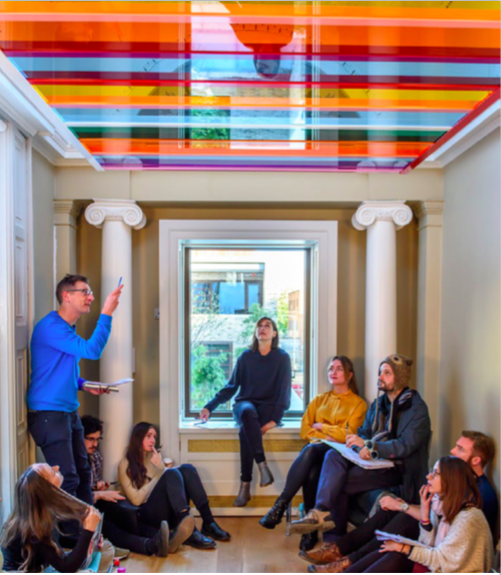 The course offers an opportunity for focused engagement with the varied challenges of today’s most ambitious art, bridging the relationship between theory and practice by creating exciting study options for artists, curators and writers. Dan Adler is Associate Professor in the Department of Visual Arts & Art History at York University in Toronto. Adler’s areas of research include the history of art writing, modern and contemporary sculpture, German modernism, and the development and reception of the conceptual art movement. His other books include the monograph Hanne Darboven: Cutural History 1880-1983 (Afterall Books/MIT Press, 2009). He co-edited (with Mitchell Frank) German Art History and Scientific Thought: Beyond Formalism (Ashgate Press, 2012) and co-edited (with Janine Marchessault and Sanja Obradovic) Parallax: Stereoscopic 3D in Moving Images and Visual Art (Intellect Books/University of Chicago Press, 2013). A former senior editor of the Bibliography of the History of Art at the Getty Research Institute in Los Angeles, he regularly contributes reviews to Artforum. An alumnus of the Whitney Museum’s Independent Study Program, he co-curated (with Lesley Johnstone) a Liz Magor retrospective exhibition at the Musée d’art contemporain de Montréal, which traveled in 2017 to the Migros Museum für Gegenwartskunst, Zürich; the Kunstverein in Hamburg; and the Musée d’Art Moderne et contemporain in Nice, France (the accompanying catalogue, Liz Magor: Habitude, was published by JRP Ringier). 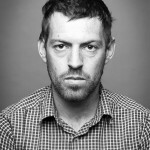 His other curatorial credits include the exhibitions “Francis Bacon and Henry Moore: Terror and Beauty”(2014) held at the Art Gallery of Ontario and “When Hangover Becomes Form: Rachel Harrison and Scott Lyall” (2006), held at the Contemporary Art Gallery in Vancouver and Los Angeles Contemporary Exhibitions (LACE). 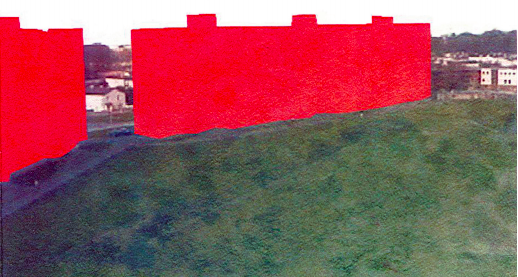 Adrian Duncan is a Berlin-based Irish visual artist who originally trained as a structural engineer. He is an alumnus of the NCAD MA Programme Art in the Contemporary World. 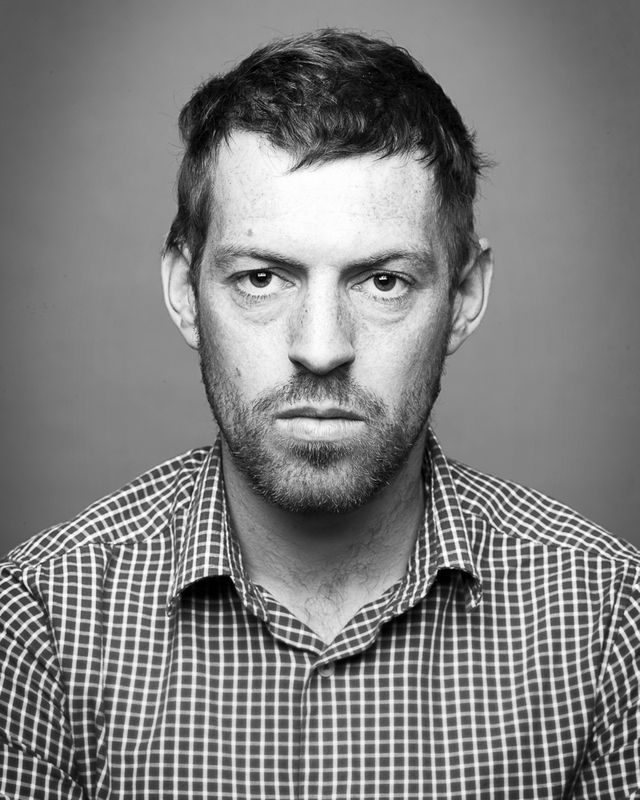 His short-form fiction has appeared in The Stinging Fly, gorse, The Moth, The Dublin Review and Meridian (US), among others. His feature film Flying Structures on Irish engineer Peter Rice, co-directed with Feargal Ward, premiered at the Dublin International Film Festival 2019. Memento Aldi, Danny Kelly at deAppendix, 30 Ardagh Grove, Blackrock. next month at the prestigious IDFA (International Documentary Festival Amsterdam). Applications are open / Deadline is June 25. Thursday 10th May, 6.00pm, National Gallery of Ireland.